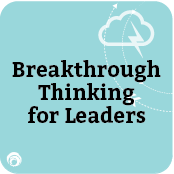 Learn how to facilitate breakthroughs in thinking on your teams and drive innovation. If innovation is to take root in your organization, managers and staff alike must approach their work in new ways, with new expectations and by thinking differently. Creativity, increasingly recognized as a critical leadership skill, enables innovation through a combination of creative process and creative thinking. To drive innovation, organizations need to define problems, structure creative problem solving and engage in disciplined idea management.